Canna lilies aren't part of the lily family, but their exotic, colorful blooms are reminiscent of members of the true lily family. Cannas also have ornamental foliage that is variegated in hues of purple, green and sometimes white. 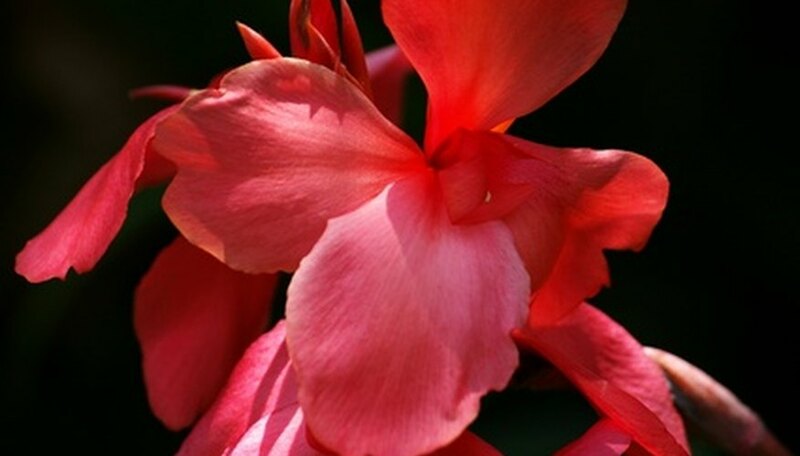 As a tender perennial, cannas cannot be left in the garden beds in areas that experience winter frost. Even in mild climates, some winterizing procedures must be followed to ensure that the canna lilies survive to bloom another year. Dig up the canna bulbs after the first fall frost causes the foliage to yellow and die. Dig around the canna bulb with a hand-held garden fork, loosening the roots from the soil gently as you dig. Slide the fork under the bulb, and lift it out of the garden bed. Cut the foliage back to within 3 inches of the bulb. Use a pair of clean shears or a sharp knife. Rinse the excess soil off the bulbs with a garden hose. Inspect the rinsed bulbs for cuts or soft spots that indicate rot, and discard any that are damaged. Place the bulbs in a warm, well-ventilated room away from direct sunlight. Leave the bulbs to dry for one to three days. Fill a box with slightly damp peat moss. Set the canna bulbs in the moss, and store at 40 to 50 degrees F until you are ready to replant after the last spring frost. Fertilize the canna bed a final time for the season in early fall. Apply 2 pounds of 5-10-5 fertilizer per 100 square feet of canna bed. Fall fertilization encourages healthy root growth, which helps the cannas survive over winter. Cut off the foliage after it yellows and dies back on its own. Cut the foliage off to within 3 inches of the soil surface. Water the bed thoroughly, so it feels moist to a 6-inch depth. Stick your finger or a trowel into the soil to check the moisture amount. Lay a 3-inch layer of winter mulch, such as straw, over the canna bed and plants. Mulching preserves soil moisture and protects the cannas from winter temperature fluctuations. Water the bed as necessary throughout winter to keep the soil moist. Do not water if a frost is expected, as the frozen water in the soil can damage the canna bulbs. Brush the bulbs with a pesticidal bulb dust prior to storage to help protect them from disease. Cannas that begin rotting in storage can infect neighboring bulbs. Inspect the bulbs monthly, and discard any that show signs of disease.